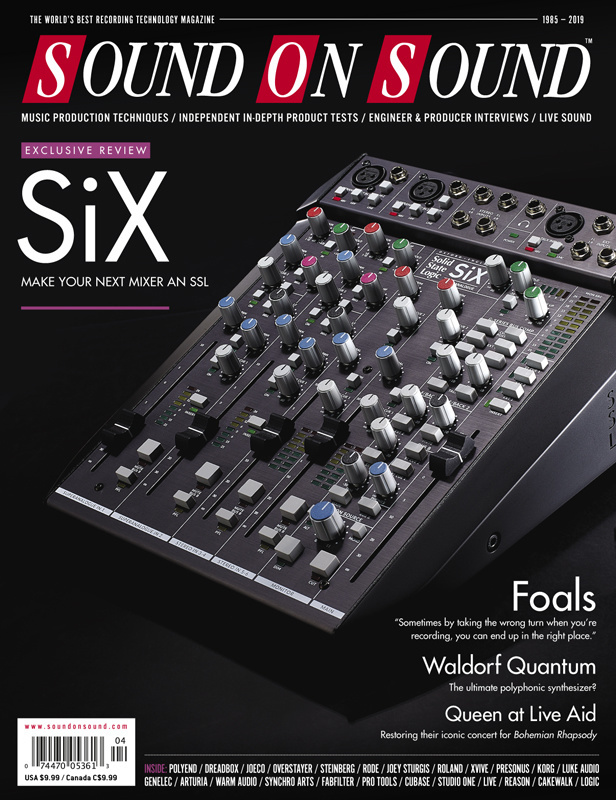 Reviews: Solid State Logic SiX (cover) • Polyend/Dreadbox Medusa • Waldorf Quantum • Arturia KeyLab MkII • Genelec S360 • JoeCo Cello • FabFilter Pro-L 2 • Synchro Arts Revoice Pro 4 • Korg Konnect PA • PreSonus Atom • Luke Audio AL-Y56 • Rode RodeCaster Pro • Overstayer 8755DM • Warm Audio WA73-EQ and more. Techniques + People: Inside Track: Queen 'Bohemian Rhapsody' Soundtrack • Foals • Mix Rescue: The Vietnam Flashbacks • Session Notes: Multi-purpose Recordings • Studio SOS... plus DAW workshops. Arturia take their KeyLab controller keyboard range to the next level. Eventide have long offered a plug-in version of their 1972 Instant Phaser hardware, and now they've revisited it to add both new capabilities and the ability to 'age' the circuity by introducing modelled component value drift. The third major update to Pro‑Q is packed with functionality, and the headline feature this time around is dynamic equalisation. FabFilter have reinvented their Pro‑L limiter for the new world of loudness normalisation. Genelec's latest monitor is a flexible beast, designed for the large multi-speaker setups that are needed in VR and immersive audio. But does this versatility come at the expense of its usefulness for conventional music mixing? JoeCo's debut desktop interface combines high sound quality, robust engineering and some unusual features. Billy Decker's signature plug-in collection is aimed at those who'd rather get things done than get into the details. Korg's new mini PA is as versatile as it is compact and portable. StageOne is a plug-in designed to manipulate stereo imaging, by extracting a signal that corresponds to what we hear as the 'phantom centre' and processing this independently of the rest. The ODR‑Mini is essentially a slightly tweaked version of Nobels' ODR‑1 overdive pedal (by all accounts extremely popular with Nashville musicians), with true bypass and a tightened low end, but squeezed into a mini‑format case. Overstayer's versatile stereo processor offers endless ways to manipulate — or obliterate — any input signal! The team behind Push Turn Move shift their attention to modular synthesis. The Medusa combines analogue and digital, synthesizer and sequencer — and even throws in a controller for good measure. The PreSonus Atom offers hands-on control and tight integration with their Studio One DAW. The RodeCaster Pro is a one‑stop shop for creating high‑quality podcasts. From the classic vocoders of the '70s through to the hyper pitch-corrected pop vocals of the last decade, Roland's VT‑4 can do it all. It may be the smallest mixer they've ever made, but the SiX shares more than just heritage with SSL's legendary large-format consoles. Rhythmic Odyssey represents a collaboration between Soundiron and the highly regarded UK-based percussionist David Oliver to develop a virtual instrument built around live percussion performances. How do you improve on the ultimate drum studio? Steinberg attempt just that with the latest version of Groove Agent. The latest version of Synchro Arts' Revoice Pro brings many new features, including improved algorithms and deeper DAW integration. Waldorf's new flagship synthesizer is complex, versatile and hugely ambitious. Find out how just how well this vintage recreation compares with the original that inspired it. Here's how to tidy up your plug-in menu in Cakewalk. Play and record external MIDI instruments in Logic. We look at how to capture and reuse third‑party samples in Live. Listing of all SOS April 2019 articles with accompanying media files. We load up the magic buses to take a psychedelic rock mix on a fresh trip. Understanding the voice count of your Pro Tools system can avoid nasty surprises on large projects. Reason may be a self-contained studio, but it can still play nicely with others. Our engineer records a rock trio while trying also to offer sufficient options to create a drum sample library! The new pattern editor in Studio One 4 isn't just for drums! Follow one SOS reader on his quest to transform a box room into a studio worthy of the name! Foals' first foray into self-production yielded not one but two albums — but making them wasn't easy! "Tracks in the context of an album can have a totally different effect in comparison to hearing those tracks in isolation..."
I'm looking through my reverb plug-in's preset list, and I'm wondering: what do all those cryptic preset names mean? Read more about Q. What do reverb preset names actually mean? I couldn't use the Neumann TLM103 as my 'kicksnare' mic, as it couldn't handle the sound level produced by the drummer. Even with zero gain at the preamp this mic produced a distorted signal. What was I doing wrong? Read more about Q. What is making my 'kicksnare' mic distort? Could you please explain what the Waves V‑Comp auto-release setting actually does? What is it trying to accomplish? Read more about Q. Why does auto-release sound so bad with parallel compression? Media content for the April 2019 issue.